To really get into the history of e-books, let's go backâway back. Right back to Plato. Remember him? The Classical Greek Philosopher? Plato had a great distrust for the written word, stating that words were "silent; they cannot speak, answer questions, or come to their own defense". While he had it right for his times, the statement leaves one to wonder what he would have thought of the written word today and the capability of audio! 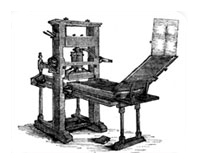 Fast forward to Germany in 1440 and the invention of the Gutenberg printing press. While movable type was already in use in China a few hundred years earlier, the precision of Gutenberg's type setting was the essential element required for western printing. The relatively inexpensive books the press could produce on paper, as opposed to parchment, removed the power of the written word from the hands of the clergy and gave it to the educated middle class. Penny dreadfuls, which made their first appearance in the 1830s were the next big leap in publishing. Printed on cheap pulp paper, these pamphlets were aimed at the youth, much like our modern comic books. They were considered cheap, mindless entertainment, much of which was written by amateur writers and some outright hacks. One popular offering, The String of Pearls, may have been penned by Sweeney Todd. The paperback book came to us in the 1930s. Most wouldn't have been allowed within a hundred yards of a public library or a reader of "serious" literature. Yet today, the paperback book is considered a legitimate form of publishing, on par with the hardback book. The paperback, which sports its own economies and markets, is written by established and celebrated authors, and sold worldwide to literature buffs and casual readers. It's now 1971 and enter Michael Hart. Mr. Hart was handed a real boon - $100,000.00 worth of computer time with a Xerox Sigma V mainframe computer. He decided that the greatest value created by computers would not be computing, but would be the storage, retrieval, and searching of what was stored in our libraries. The first "e-book" was bornâa copy of the Declaration of Independence. Those humble beginnings would become Project Gutenberg. Today Project Gutenberg houses 20,000 free texts and over 100,000 books are available through their partners. Today over 3,000,000 books are downloaded each month. E-books appeared on the web, easily shared and stored on a hard drive or storage disk, and quickly began to proliferate. Early e-books were generally written in specialty areas, intended to be documents that only small groups might share, and therefore were few and far between. Their subject matter ranged from technical manuals for cutting-edge hardware and manufacturing techniques... to material "not suited for minors"... and everywhere in-between. This fractured market of independents and specialty authors created a lack of consensus on the best way to package, sell, or read e-books. Numerous e-book formats emerged and proliferated, some supported by major software companies (like Adobe's PDF format), and others supported by independent and open-source programmers. Multiple readers naturally followed multiple formats, most of them specializing in only one format, and thereby fragmenting the e-book market even more. The result was a lack of an overriding voice with the public regarding e-books, which kept e-books from becoming a mainstream product. E-books continued to gain in their own underground markets. Many e-book publishers began distributing books that were in the public domain, or that were simply old and hard-to-find. At the same time, authors with books that were not accepted by their publisher began to strike out on their own, offering the books online so they could be seen by others. Unofficial (and occasionally unauthorized) catalogs of books became available over the web, and sites devoted to e-books began spreading the word to the public. One of the first genres to become successful in the e-book field was that of the romance story. Romance novels were perfect for e-books, the genre already considered a "guilty pleasure" by most of the public, due to its oft-ridiculed and notoriously salacious content. E-book romances were easy to shop for and buy from the privacy of your home, and just as easy to read without revealing your guilty pleasure to others. Unbeknownst to the rest of the world, romance e-books had become a quiet success. Libraries began to pay attention to e-books in 1998 when NetLibrary, a Colorado-based firm began to provide content. In 2002, they were purchased by OCLC (Online Computer Library Center, Inc.) who continues to provide content to libraries today. The major publishing companies finally took notice of the e-book movement around 2001. The publishers, at first frightened of the capabilities of the new medium in much the same way as the music industry was against the MP3, are now following the music industry's example in trying to better understand, and ultimately take advantage of, the new e-book formats. They have established online stores and partnered with e-reader manufacturers to establish themselves in the e-book market. Concurrently, electronics hardware manufacturers are working on dedicated e-book readers, also hoping to capitalize on the e-book movement. With all of this activity by major publishers and electronics companies alongside independents, new selling models are being developed, formats are beginning to homogenize, dedicated reading hardware is now available, and thanks to the Internet, e-books are achieving global distribution. Today, e-books are spawning new e-publishing houses, electronics manufacturers are releasing more e-book readers designed for the masses, and software designers are creating new reader applications for portable electronics gear like handheld computers, smartphones and game consoles. Let's not forget audio books as a form of electronic book. Busy, on-the-move readers can load a book in audio format onto their portable equipment and enjoy someone reading their favourite book them. A company called E Ink recently introduced a new display technology, e-ink, which mimics the look of paper better than any other display technology. Its introduction into the latest reading devices has been hailed by many consumers as being far superior to LCD displays. Then Oprah got involved - announcing that Amazon's Kindle e-book reader was her favorite gadget - and e-books met popular culture. Amazon couldn't keep enough Kindle's in stock to meet the demand. Sony also introduced a portable reader using the same e-ink display. The Sony PRS505 with it's amazing 6 inch screen was soon a crowd pleaser. Today consumers can find more of the kind of literature they want to read, from best-sellers by established authors, to cutting-edge material by daring new authors, and everything in-between.